Yesterday afternoon, Jon started making noise in the kitchen… chop chop chop, scrape scrape scrape, bang, clang, bang. He emerged with five small bruschetta-esque Chicken Salad treats. 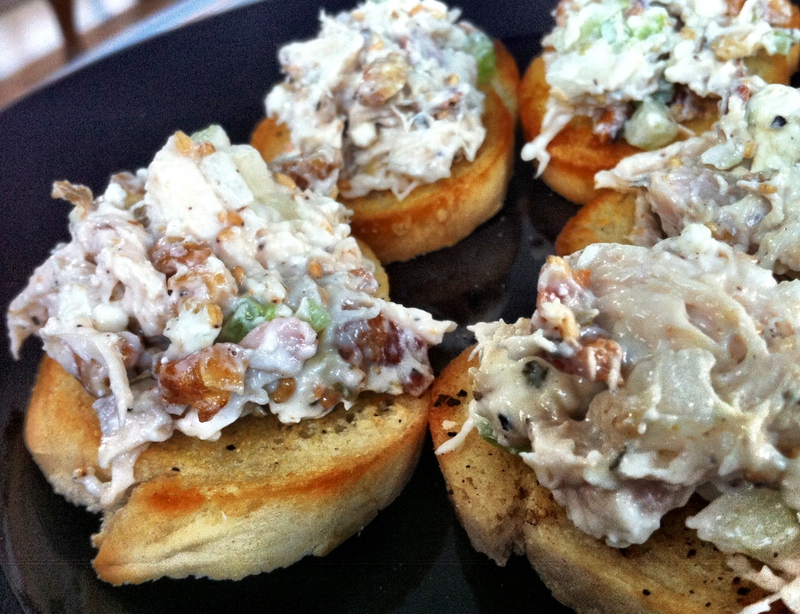 Placed just right on the butter and garlic toast, was the prettiest Chicken Salad I had ever seen… and the taste? I am not exaggerating when I say it is the best chicken salad I have ever had. To make sure I wasn’t dreaming, I had it again for lunch today and reconfirmed that sentiment. The best, hands downs, chicken salad I’ve ever had- the crunch of the roasted walnuts, coupled with that tangy “just want to eat a pound of it” of blue cheese- perfection, really. You must try it. Ingredients: Shredded chicken (we like to use the rotissiere chicken from the grocery store, but in this case, we simply used a chicken breast), miracle whip, celery, onions, roasted walnuts, crumbled blue cheese, bacon, toasted sesame seeds, salt and pepper to taste. Mix together and voila! Jon used a small loaf of Italian bread, cut into small pieces, buttered and broiled briefly and sprinkled with garlic.